$#*! my dad says, cancel or keep? If you thought a sitcom based on the Geico Cavemen was strange, one that’s based on a Twitter feed seems really crazy. $#*! My Dad Says also certainly wins the prize for having the most awkward title in TV history (CBS maintains that it should be read as Bleep My Dad Says). In any case, the show finally debuted last week. How did it do in the Nielsen ratings? Will it last or be quickly cancelled? $#*! My Dad Says revolves around a young struggling writer who’s out of money and must move in with his cranky and opinionated father. The new TV show stars William Shatner, Jonathan Sadowski, Will Sasso, Nicole Sullivan, and Stephanie Lemelin. In its first week on CBS, $#*! My Dad Says did very well, despite some poor reviews. In its Thursday night timeslot, the sitcom attracted a 4.0 rating in the 18-49 demographic and 12.58 million total viewers. That was enough to put the show in first place in both categories. What do you think of $#*! My Dad Says? On the negative side, though a 4.0 rating is still great, it did lose almost 20% of its lead-in audience in the demographic. The Big Bang Theory scored a 4.9 rating. The real question will be to see how many viewers return to watch week after week. The show is obviously benefiting from its timeslot, sandwiched between Big Bang and CSI. With such a great timeslot, the network’s expectations are high but for now, $#*! My Dad Says certainly looks safe from cancellation. But, what do you think? Is $#*! My Dad Says worth watching week after week? Should it be kept or cancelled? More about: $#*! My Dad Says, $#*! My Dad Says: canceled or renewed? I look forward every week to view this show,and I have missed BLEEP my dad say’s. Plus William is GREAT. I LOVED THIS SHOW AND WATCHED IT FROM THE START, THEN NOTHING! !WILL IT BE COMING BACK..DOES ANYONE KNOW? 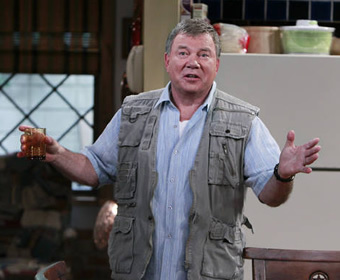 WILLIAM SHATNER IS A GREAT COMEDIC ACTOR AND HOPE TO SEE HIM ON THE SHOW AGAIN….THEY REALLY LEFT US HANGING! WE LOVE THIS SHOW, everyone is halarious and we hope its not cancelled ! for this part. Thanks and PLEASE keep it going!!! keep that “RULES of ENGAGEMENT” David Spade is not funny, I find that is BORING. get who ever is deciding about tell them to wake up and something about it. This is a G8Tcomedy show!…love the time slot!…love the characters!…funny book! Where’s the show? I miss it! Best show on TV, put it back on, we miss it!!! PLEASE bring this back! I really miss it! This show was a great chaser to Big Bang Theory!!!!! It will never be the same without it! Bring this show back. Pleease! This is one of the funniest shows that I can relate to. This is a very funny show. We already love the characters. Wm Shatner is a hoot!